DISC Graduate Fellows have spearheaded the text analysis effort, and made the LIBVOYANT project possible. Students have completed OCR processing and quality assurance on six important manuscripts by Tony Hillerman and Rudolfo Anaya. To date, manuscripts for Tony Hillerman's Blessing Way, The Fly on the Wall, and Dancehall of the Dead have been TEI encoded so they can be visualized and compared using the LIBVOYANT server. Also, Rudolfo Anaya's Bless Me, Ultima (almost complete), Tortuga, and Heart of Aztlan have also been encoded for online analysis. On the LIBVOYANT home page, simply click the OPEN button and select which author's work you would like to visualize. 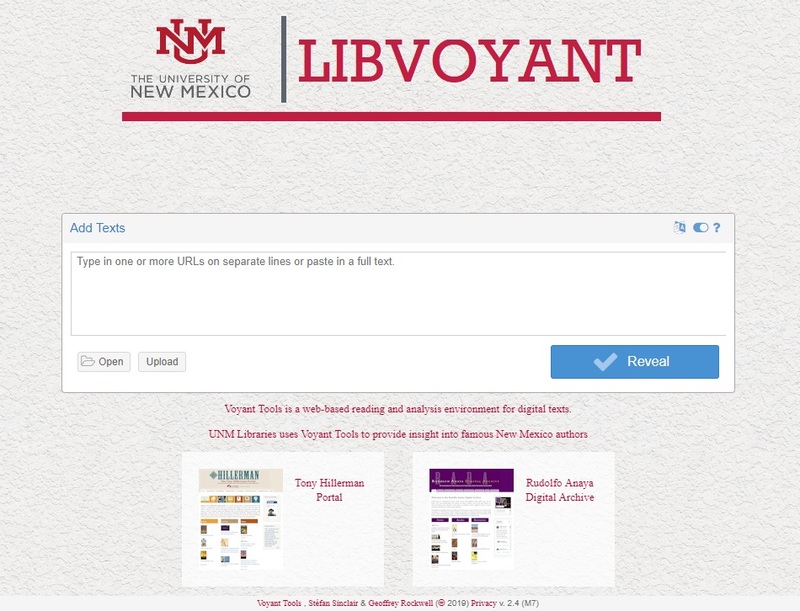 In addition, you can also upload your own cleaned, plain text or TEI encoded documents to LIBVOYANT so you can use the visualization tools on other works.